Be part of the Ethics in Action Workshop, Engaging with the ECA Code of Ethics, this series of five half-day workshops will be held across regional New South Wales and facilitated by Catharine Hydon, co-author of ECA Code of Ethics and Ethics in Action: A practical guide to implementing the ECA Code of Ethics. This is a rare face-to-face opportunity to be part of the discussion, share your experiences and bring your questions. 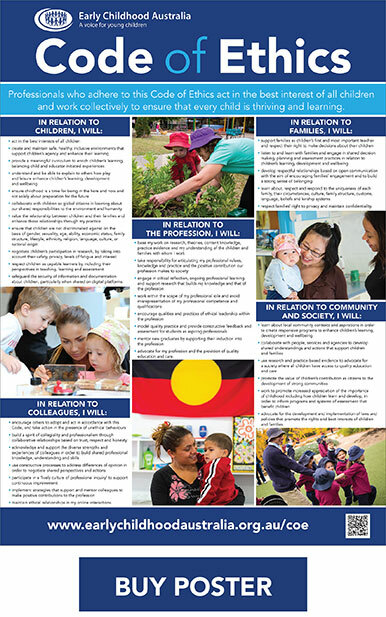 Designed especially for early childhood education and care environments, and based on the principles of the United Nations Convention on the Rights of the Child (1991) this code of ethics has followed a national process of consultation, with the emerging standards indicative of the values we share as early childhood professionals in Australia. Early Childhood Australia recognises that Aboriginal and Torres Strait Islander people have been nurturing and teaching children on this land for thousands of years. The Code of Ethics acknowledges Aboriginal and Torres Strait Islander traditional ways of being and caring for children. This Code is not intended to, and could not possibly provide easy answers, formulae, or prescriptive solutions for the complex issues early childhood professionals face in their work. As an aspirational document, it does provide a basis for critical reflection, a guide for professional behaviour, and principles to inform individual and collective decision-making. Professionals who adhere to this Code of Ethics act in the best interests of all children and work collectively to ensure that every child is thriving and learning. The brochure outlines Early Childhood Australia’s Code of Ethics in easy-to-follow point form. Click here to access a printable version of the Code of Ethics brochure. Sets out the Early Childhood Australia Code of Ethics in clear print and is suitable for display on notice boards in childcare centres and early childhood training environments. This NEW easy-to-use practical guide is suitable for all educators, managers, leaders and childhood professionals caring for children from birth to 12 years of age. 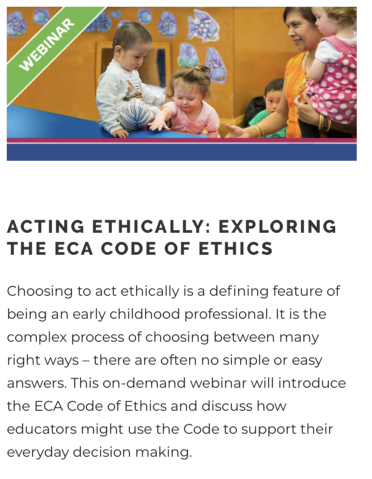 This essential and practical 95-page guide to the Early Childhood Australia (ECA) Code of Ethics clearly explains what ‘code of ethics’ means in everyday practice. You will discover case studies, scenarios and provocations to help guide you with everyday ethical implementation. 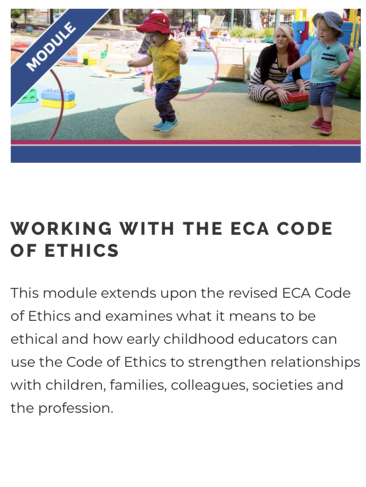 Developed from the early learning and care sector’s desire to commit and enact ethics in daily practice, this easy-to-use publication will support you in bringing ethics into action! Find out more about the Ethics in Action—A practical guide to implementing the ECA Code of Ethics. Ethics in Action: A practical guide to implementing the ECA Code of Ethics is great value at only $84.95, and bulk order purchases (10 copies or more) at $69.95. Order your copy here or call 1800 356 900 (free call in Australia) or email customerservice@earlychildhood.org.au.